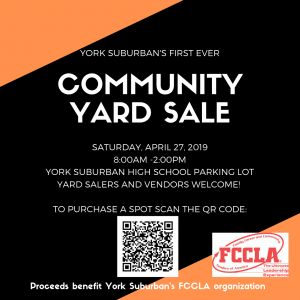 The purpose of the yard sale is to help raise funds for the YS FCCLA organization. FCCLA is a national leadership organization rooted in the Family and Consumer Sciences field. FCCLA stands for Family, Community, and Career Leaders of America. Make checks payable to York Suburban SD. A confirmation email will be sent once payment is received. Reservations must be made by April 19, 2019. Exhibitors will supply their own tables, chairs, and/or tents. Tents must be weighted down; however, you are prohibited from placing anchors in the black top. There is NO electricity available and generators will NOT be permitted. Setup will begin at 7:00am on Saturday, April 27, 2019. You will be assigned a spot upon arrival. Unless your vehicle will remain in the space for the entire day, all vehicles must be removed from the exhibit area by 7:45am. Your vehicle will be parked near Valley View or you may choose street parking. **PLEASE ENTER THE REAR PARKING LOT FROM HOLLYWOOD DRIVE–ENTRANCE CLOSEST TO THE BUILDING. Exhibitors may NOT provide concession stands or sell food for consumption on-site. There will be food vendors available. If a vendor’s product is food, they may provide samples only. Exhibitors are responsible for cleaning up their own area before departing. Trash service will NOT be provided. Exhibitors are requested to remain set up until 2:00pm. You you need to leave early, please locate an FCCLA member to assist in retrieving your vehicle. All exhibitors must vacate the premises by 3:00pm on Saturday, April 27, 2019. All York Suburban School District rules and expectations will be observed. Tobacco, e-cigs/vapes, alcoholic beverages, and controlled substances are strictly prohibited. Collection of any and all applicable SALES TAX are the responsibility of the vendor. YORK SUBURBAN SCHOOL DISTRICT AND/OR YS FCCLA IS NOT RESPONSIBLE FOR ANY LOSS OR DAMAGE DUE TO ACCIDENTS DURING THE EVENT. PLEASE BRING THIS SIGNED FORM TO THE EVENT. IT WILL BE COLLECTED UPON ARRIVAL.